Discover an offense that spreads the floor and gives your players room to attack! 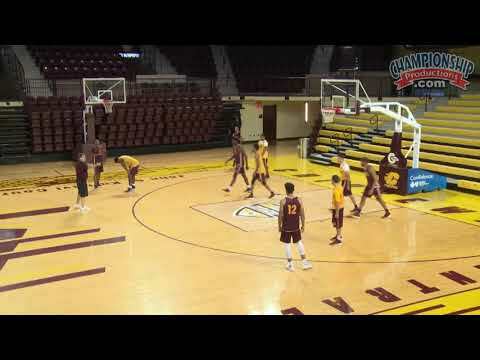 In this video, Keno Davis gives you an introduction to today's modern basketball offense that emphasizes the 3-point shot, spacing the floor, and running an up-tempo style. If you're looking for a system that will allow your athletes to take advantage of their skills while using solid offensive principles, look no further! Coach Davis covers which statistics he uses to gauge success and provide feedback for his team on offense. Additionally, he breaks down specific sets and how to improve your team in these vital areas. Virtually every aspect of a space and pace offense is covered. You'll learn how to transform your team into a fast break juggernaut and how to keep pressure on defenses by seamlessly transitioning into a secondary break. How to position players on defense to maximize their offensive effectiveness. Multiple ways to get the ball to your best players in areas where they will excel. How to create driving lanes and put maximum pressure on the defense. With whiteboard illustrations and on-court demonstrations, Davis will show you available options in a variety of sets and how to break down and sequence reads so that your players play with confidence and efficiency. You'll learn multiple ways to use the spacing concepts in this video to pull your opponent's shot blockers away from the rim and reduce their impact on your team's offense. Davis also goes into detail about how to set up and exploit both single and double ball screens to create more space for driving the ball and more open 3-point looks. Additionally, with more high-percentage shots, you'll naturally increase your team's chances of winning the free throw battle. Coach Davis does a fantastic job of creating scoring opportunities for his players with his space and pace offense. Whether it's through ball screen action, dribble drive or transition, Davis' system will give your team what it needs to score!